For nearly two weeks, Anastasia Stepanova, an author and journalist from Moscow, went outside exclusively in a spacesuit, ate freeze-dried food and slept in a sleeping bag. She was preparing for the colonization of Mars, which is set for 2024. “Dear Anastasia, congratulations, you have made it to the final round and will soon be going on an interim two-week mission to the Utah desert. The last phase of training will be held at a research station in the Arctic”. This exciting letter from the Mars Society completely changed my life overnight. I joined the Mars One project, which provides intensive training for people who could become the first to colonize Mars in 2024. Out of 200,000 applicants from all over the world, only 635 have been shortlisted. As children we often dream of big things. But when we get older, we often trade those dreams for goals imposed on us by the outside world rather than the world inside us. A year ago, I woke up and realized that the only way to become happy was to start turning my dreams into reality. I had been dreaming of going to space for 20 long years. I graduated from the Moscow State University space journalism school headed by cosmonaut Yury Baturin and co-authored a book about space called, “Have a Good Flight.” But I never took any practical steps to fulfill my dream. In April 2013, I finally realized that it was time to act and joined the Mars One project. I also made contact with American aerospace engineer and author Robert Zubrin. He founded the Mars Society, whose main task is to actively support and promote human exploration and the colonization of Mars. It was Robert who told me about two simulation outposts: one in the Utah desert and another on Devon Island in the Arctic, where teams of scientists, engineers and students live for several weeks in complete simulation. I applied for a year-long Mars Arctic 365 mission on a research station as an author and journalist and was selected. Usually a team of six people arrives at an outpost for a period of 14 days, 11 of which consist of simulation, an imitation of an astronauts’ life on Mars. When going outside you must wear a spacesuit and food is prepared using freeze-dried products and plants grown in a greenhouse. It is necessary to control water and power consumption. One can exit the simulation mode only in the case of an emergency. The nearest settlement to the outpost is Hanksville, a very small town with a population of 250 people. The rocky desert here changes its color from red and brown into white, kilometer after kilometer. Driving past layered white rocks and red-yellow sands, it is easy to imagine being an astronaut in a spaceship flying above the surface of Mars. Our team, No. 143, consisted of geologists, biologists, engineers and physicists from various countries. We got up at seven in the morning and made breakfast. Sleepy, yet excited, we would discuss the plan for the day. Usually our extra-vehicle activity (EVA) begins at 10 in the morning but it takes 30 minutes to prepare for it. So we have an hour and a half between breakfast and EVA to check email, prepare equipment and read all necessary materials for the research tasks ahead. Different types of EVA include technical maintenance of the station, geological and biological research. EVA lasts two to four hours. 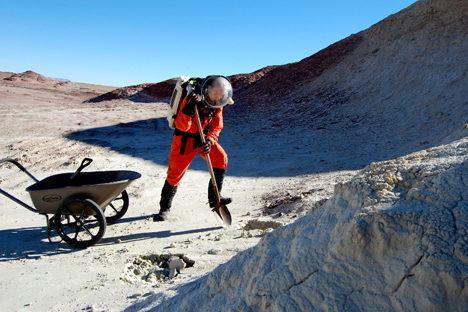 To get ready for an exit from the station, it is necessary to put on a spacesuit, special boots, a hands-free kit, a radio transmitter, a rucksack with a ventilation system, a glass helmet and bulky gloves. We all helped each other to connect ventilation tubes to the helmet because everyone is clumsy in a spacesuit, which weighs eight kilograms. A member of the crew always remains at the station and controls everything that is happening “on Mars” via radio “comms” every 15 minutes. Every day we must send reports back to the operator on Earth, including geological, biological, research, engineering and journalistic reports, as well as photo documentation. When we had performed all our duties, we would go back to our warm sleeping bags or, if we were up for it, watch films about space. For most people the thought of only being able to go outdoors if wearing a spacesuit seems burdensome and nightmarish. But for us, these were exciting first steps towards a long journey to Mars. The training itself is exciting. You feel like a real astronaut or a special agent on a mission. Of course, our spacesuits were far from the real thing. But, seeing the red rocky hills on the horizon, hearing one’s breath in the helmet and radio communications between different members of the team, it can feel as if you are really on Mars. It took just 10 days of simulation to distance oneself from reality. We left the station and saw the world from a completely different perspective. We began to appreciate the simple things, such as a bird’s song, fresh air, a hot shower and fresh fruit. Now everything has a new taste. Every smile, every thought, every experiment is important and we have all changed. Space makes us better. The key to happiness is to never stop dreaming and to not waste time on things that aren’t important. You must use every moment and every opportunity to fulfill your dream.